I barely have any other words. Okay, that’s a lie. We all know that I have waaaaay too many words, including way too many of the same words. Maybe Santa will leave a thesaurus in my stocking. But since there isn’t one in my possession yet (lies… everything is on the internet… lies), I will attempt to refrain from shouting OMG, obsessed, freaking amazing and I’m dead. Because that’s all that is running through my mind with this goodness. I’m going to be Santa and I’m going to leave this in everyone’s stocking. If I don’t eat it all first, that is. Just look at that peanut butter STUFFED inside this bark. Is that even real life? I don’t know how I can handle it. It’s no secret that I’m a salty sweet girl – I’ve been consuming chocolate and salt for as long as I can remember. When I was seven years old, I walked into the kitchen to find my brother eating a stick of butter (yes an actual STICK) and a few years later, my other brother ate all of the SALT in the bottom of the pretzel bag (yeah that did not go over well), so I think it’s safe to say that they are savory guys. But you could always find me dipping pretzels into the peanut butter jar. Or better yet… dipping chocolate covered pretzels into the peanut butter jar. Hold up, gonna go do that right this second. This is clearly why I am absolutely nutso over the Lindt CLASSIC RECIPE Salted Pretzel bar. When this was developed, someone had to be spying on my brain. Because not only do I love the flavor, but the texture! The crunch! The salt! The chocolate. It’s a freaking dream. So while I’ve done my fair share of chomping on this bar alone, I was craving a recipe build with it. Especially after making my peanut butter pretzel chocolate ice cream this past summer. Next thing you know I’ll be trying to stuff peanut butter, pretzels and chocolate into tacos. Enter: chocolate bark all around. I am a huge, huge, huge fan of bark, not just for the eating purposes (um, hi, of course), but for the gifting purposes! It’s lovely when wrapped up with a sparkly bow and given as a hostess gift. It’s even better when piled on a cooking tray among other flavors of the season. It breaks up the monotony of peanut butter blossoms and sugar cookies and chocolate chips and what not, you know? That’s the way we do it most often – Eddie building his massive cookie trays (they take at least an hour, it’s an art) and this is so easy to make. Just need enough patience to let the chocolate set. You may remember that shortly after the birth of this blog, I went through a MAJOR bark phase. Cake batter bark, 4 layer oreo bark, island coconut bark. I made a bunch of barks for gifts that year and let’s just pretend we don’t have to back and read posts from 1825ish days ago. Ooomph. 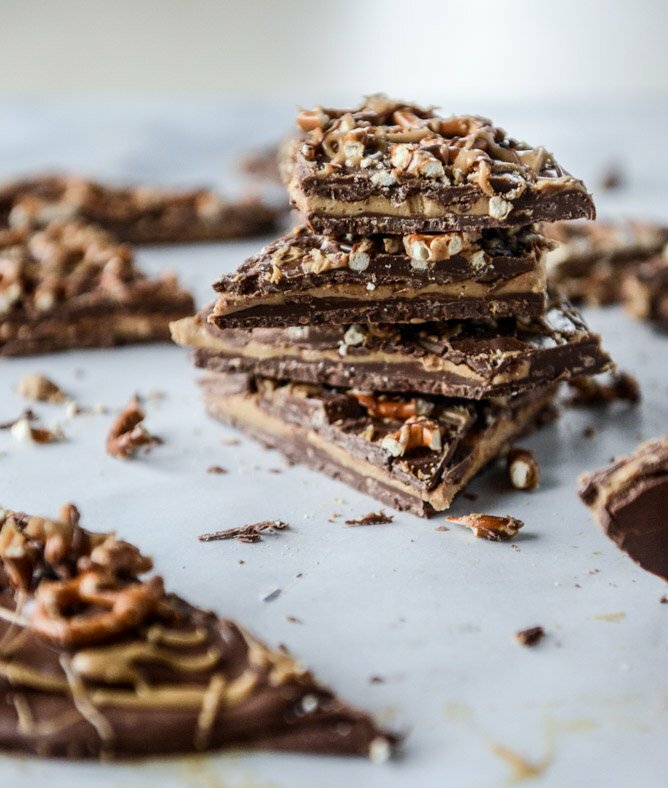 This bark is made with two of my favorite bars: the Lindt CLASSIC RECIPE Milk Chocolate Classic and – that Lindt CLASSIC RECIPE Salted Pretzel bar, and is another collab with Lindt and their to-die-for chocolate. It’s a miracle that I could even stop eating the Salted Pretzel bar long enough to melt it down, honestly. And you could totally use darker chocolate, maybe even white chocolate?! to mix it up a bit. In case you’re like me and have a terrible time following instructions. So how do we do it?! We have a layer of chocolate – a mixture of with the pretzels and without, a layer of peanut butter – which is almost just like the center of a peanut butter truffle, so fluffy an wonderful and creamy, but sturdy enough to not melted under another another layer of chocolate, and finished with tons of crunchy, salty pretzels and a peanut butter drizzle. To make the bottom base of the bark, take two of the chopped pretzel bars and two of the chopped milk chocolate bars (or just have of the chopped mixture, if you’ve already combined it all) and melt them. You can do so over a double boiler or melt at 50% power in the microwave – if doing that, I melt in 30 second increments stirring well after each until melted. Spread the chocolate on the parchment paper in a big rectangle (or any shape you’d like!) and let it sit until firm, about 1 hour. To speed up the process you can stick it in the fridge, but I don’t do that until after the peanut butter layer. Add the peanut butter, sugar and vanilla extract to a large bowl. Mix well until the sugar is incorporated and the peanut butter is similar to the inside of a PB cup and not meltable. Once the chocolate is firm, gently spread and press the peanut butter on top, leaving a 1-inch border around the outsides. This is when I place the mixture in the fridge, allowing it to firm up for about an hour. Melt the remaining chopped chocolate. Remove the pan from the fridge and gently spread the melted chocolate over the peanut butter layer, covering the peanut butter and meeting it to the bottom chocolate edge. Sprinkle and place the pretzels on top, along with any additional chocolate pieces you may wish (I chopped up another bar and put pieces on there). Drizzle with the melted peanut butter and let sit until firm, at least one hour. You can stick it in the fridge again if you like! Once ready to eat or set up, break into pieces. This will keep for about a week at room temp (or longer in the fridge and definitely the freezer)! I want to peanut butter glue myself into that mess. Can I just say, with everything you post here and all the other places your work is featured, I don’t know HOW you do it! I LOVE love your site and cookbook and turn to your recipes when I’m especially wanting fun food for parties or just to make a weekday dinner extra indulgent. You are insanely creative and talented and I love your posts about motherhood, too (hopefully they are helping me prepare for that someday, ha!). Thanks so much for your hard work and sharing with us all – it is greatly appreciated!! Yum! Don’t forget to leave some in my stocking, hah. I love easy recipes that are full of different flavors like this, plus it’s pretty when you break it up. Did that sounds weird? Ha, I just love food! oh my goodness yes!! i love barks with anything crunchy- there’s an amazing one from tutti dolci’s site with espresso and chocolate wafers. can’t wait to try this one (and i’m sure all the recipients of my baking craziness will be even more excited). also, how come i’ve never thought of dipping pb stuffed pretzels in chocolate?? Yum! I make something similar with dried apricots but I love the sweet and salty aspect of the these. Mmm this bark looks so good! I’m probably gonna go with dark chocolate cause I’m just a sucker for that but I just love that layer of pretzel and peanut butter! And wow your brothers had stomachs of steel! If i made that I would eat all of it! It looks so yummy!! Oh this bark looks so gorgeous. 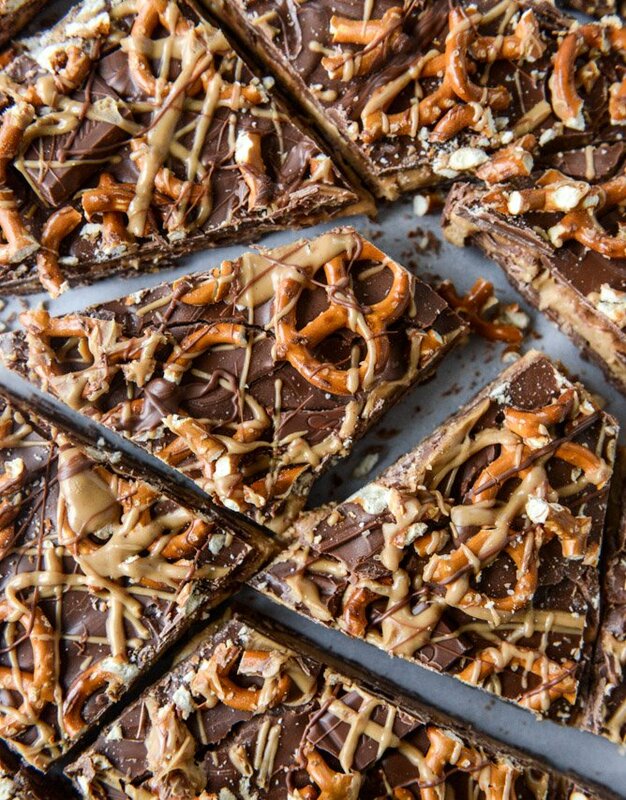 As if bark isn’t amazing enough, you stuffed them with pretzels and peanut butter and took them to the next level. I can’t wait to give these a try! Wow, this looks incredible….and majorly dangerous! I’m suppressing the urge to run around screaming and waving my arms around. THIS LOOKS FABULOUS. I’m definitely making this for our family holiday boxes (<- when a plate just isn't enough). Why have I never thought to make bark with a filling??! This looks great. I am a sucker for PB. Can you please show us a pic of Eddie’s legendary cookie trays? Please, please! I agree – please, please show us the cookie trays! I have about a million family members who would flip out over this! This looks amazing and just got added to the already long list of Christmas cookies I’m going to make. Do the pretzels on top get soggy at all or will they stay crunchy for a while? Oh my goodness I love chocolate and pretzel anything. This looks so fabulous! Whoa!!! I am a huge sweet & salty girl as well. My fav snack at night is dipping dark chocolate covered pretzels into a peanut butter jar. I have to get my hands on that Lindt bar! I have so much Christmas shopping to do, but yesterday I went to Target and fought the Sunday crowd just for baking supplies and didn’t buy a single gift. I have a feeling that will be happening again. Love this bark!!! Oh my goodness…. Oh my goodness… My heart just burst with the happiness of all my dreams coming true. But oh well, it’s Christmas, and if I’m going to splurge on food, this might just be the dish I make! Thanks for the recipe once again, Jessica! Ok here is a cooking challenge. I often hate cake icing unless it is whipped cream based because it is just too sweet for me. I love peanut butter, I do, just the way it coes out the jar. Is there any genius way to make a thick peanut butter filing for this bark without adding that powdered sugar? Could you chop a ton of peanuts finely and stir it in to bind it and thicken it? As weird as it sounds could you use milk or cream and peanut butter, chopped peanuts, and cornstarch to make a thicker filling? Do you in all your creativity think there is any way to come up with a peanut butter bark filing that does not require adding powdered sugar (ok maybe a tad may be needed but think it may be fine without any at all in terms of sweetest hanks to the chocolate)? Or do I just have to settle with enjoying the great, drool-inducing photos? Hi Anne. Have you considered simply starting with a commercially made ‘no added salt no added sugar’ peanut butter? That way, the icing sugar (sorry, powdered sugar) would probably do nothing more than bring it up to the sweetness of ‘normal’ peanut butter. Icing sugar is very light and 3/4 cup won’t impart anywhere near as much sweetness as 3/4 cup of ordinary sugar would. I think cornflour would mess with the texture and it really only acts as a true thickening agent if its added to a warm mixture which would then melt the chocolate. You could get tricky with things like Xanthan Gum, but in all honesty this is a sweet recipe. I don’t think the omission of the icing sugar would change it all that much. Good luck! Sorry for all those typos! Bark excitement syndrome! Made it last night. I wish i could post a photo because it’s a thing of sheer, unadulterated beauty :) I have no idea how it tastes because it was 12am when I finished it and 5am when I cut it, so I wasn’t in the mood for chocolate either time. My son is at home on school holidays though, so I dare say I’ll have his verdict as soon as he gets out of bed! This is the best looking bark I’ve ever seen! literally. drooling. definitely need to try this! I’d like a big batch of this in my stocking! Yum! What size pan are you using, just a standard cookie sheet? Love, but with the melted peanut butter on top I can’t imagine this traveling or gifting well without becoming messy. I’m not opposed to the messy, but gift-wise and when combined with other confections, was thinking it could be too much…yes? I’m always astounded by your creativity!! Pretzels, yes! Peanut butter layer in between chocolate? Yesssss!!!! I love this. As a PB addict and a sweet & salty love, this is incredible! First of all- I might be obsessed with you (in all the best of ways not like the weird stalker-y ways). Seriously every post I read and its like you’re INSIDE my head because I think we may have the same brain. And if I have the same brain as you I’m counting my lucky stars. Aaaaaanyway, I saw this and knew immediately it would be the PERFECT hostess gift for this party I’m going to so I had to make it. I sadly could not for the life of me find the Lindt salted pretzel bars (a million sad faces :( ) but I found a different one and it worked fine. BUT the part I felt inclined to tell you about was that I mixed in a Voges dark chocolate bar in (mostly because milk chocolate to me is just a tad tooooo sweet. But I didnt just add ANY Voges bar, no no, I put the Mo’s dark BACON (https://www.vosgeschocolate.com/product/mos_dark_chocolate_bacon_bar/all_bacon_chocolate) one in the chocolate. Holy Camoley let me just tell you, do it. Because the smokey flavor of the bacon and all the milk chocolate and salty peanut butter and pretzels HOMG. Ok but anyway keep being the majestic unicorn you already are, the world needs more bacon and chocolate and less veggies (blech). these are SO CRAZY GOOD!!!! it’s freakin’ hot summer now, so i keep a stash of these in the freezer. and by “keep”, i mean that i hide them in the back of the freezer, hoping no one else will find them. thank you so much for sharing this! These were insane! Super easy to make and results just as advertised. The crowd went nuts for them. A couple of things: I couldn’t find the chocolate pretzel bars either (though they sound like heaven) but I also knew that buying 8 Lindt bars would make the recipe outrageously expensive. So I did the math, saw that a Lindt bar is 3.5oz, and then just bought a couple bags of Ghirardelli dark chocolate chips. I was short a couple oz of chocolate overall but it didn’t really matter. I just adjusted the recipe accordingly by shorting everything else just a little. When I melted the chocolate chips, I sprinkled in sea salt and just before pouring it, folded in pretzel bits to try and get as close to the original recipe as possible. Worked like a charm! My only other observations – the 1/3C of peanut butter for drizzling seemed like way too much. I think 2-3 Tbsp would be more than enough. I drizzled a significant amount over the surface and still had quite a bit left that got thrown away. And I recommend letting these cool for as long as possible to harden. I had to cut them a little earlier than I liked, and while everything was set, the layers came apart in some places. I wanted to let you know that I made this the weekend before Christmas and it was SO good! I could only find 2 of the Lindt Pretzel bars so I improvised with extra milk chocolate bars and extra crushed pretzels. Everyone loved it. I did make it a little too thick, but that didn’t stop anyone from scarfing it down. Thanks for a new holiday go to recipe for next year.